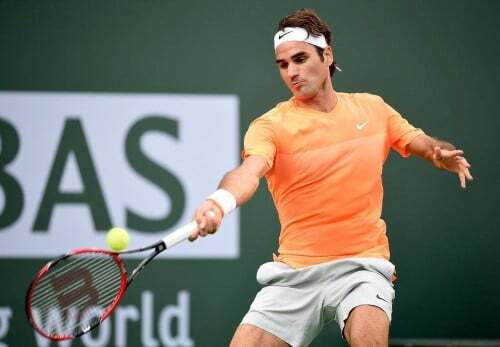 Normal service resumed here in the Sepperer rivalry as Roger avenged his Australian Open loss to the Italian by defeating him 6-3 6-4 at the BNP Paribas Open. Not a match that will live long in the memory as it was dominated by errors from both players as they struggled to acclimatise to the night time desert conditions in Indian Wells. Despite the low quality it was the Swiss who made the best of things, serving well when he needed to and returning solidly to break Seppi 3 times across two sets and cross the line as the worthy winner in his first night session match of the week. It absolutely was an opportunity right away to play him again and sort of erase it to some extent from the memory as the season moves forward. It's one of those matches you're happy you're through, and I was happy it was over. Federer won the toss and elected to serve, holding to love thanks to Seppi making 4 unforced errors in a row. The Swiss then had an immediate chance to break but Seppi held to level at 1-1. The South Tyrol native then made his own inroads on the Federer serve creating love thirty but Roger fired down some timely serves to hold. At 3-2 Roger again had break point but couldn't convert, making sloppy errors on the important points and allowing Seppi to hold. That patttern continued until 4-3 where Fed took his 4th break point of the set, breaking the Italian from 15-40 behind to lead 5-3. He then saved break point himself at 30-40 to take the opener 6-3. With Seppi serving first at the start of the second Fed again had an immediate chance to break but failed to convert. However after holding to love he got the breakthrough to lead 2-1; probably the point of the match in this game too at 0-15 where Fed used a ton of variety to finally draw the error from Seppi. It looked like it would be plain sailing after that but an untimely double fault let Seppi back in to level at 3-3. Fortunately though Seppi was right back at standard Seppi level and he handed Fed another break in his next service game. That one proved to be enough and despite seeing 2 match points pass him by at 5-3 Roger held to 30 to close it out 6-4 and score a pleasing win against his Australian Open conqueror. So I'm still figuring out exactly how the court plays and the balls react. So that's why I'm very happy to be in the (fourth) round to give myself another opportunity to play in these conditions and hopefully move forward. The pleasing aspect for Roger is to get the win and put to bed some of the bad memories from Australia. Obviously a Slam loss can't be undone by a win at a Masters 1000 level but will definitely help to some extent. He also keeps up the winning streak from Dubai and keeps himself in the tournament as it nears the latter stages. So far Fed has been struggling to find his range and in these conditions winners don't come easy so it's a huge adjustment from Dubai but he the more court time / matches he gets the better the chance of coming good at the right time. He managed it in 2012 looking sloppy against Bellucci and Kudla before winning the whole thing so no reason why he can't do something similar here. Next up is Jack Sock who defeated the Royal Bank of Agut in 3 sets coming from a set down to get the job done. These guys have never played before on tour but as you can see from the picture above they've practised together on a couple of occasions. That should give Fed enough intel he needs on what to expect. Fed stated in the presser that he know's he is going to be “tough to beat” but that basically says to me the match is firmly on Roger's racquet. I don't know much about Sock other than seeing some of his doubles matches at Wimbledon last year but he hits with a fair amount of top spin, has a big-ish serve and clearly favours the forehand. I think he's kinda similar to Roddick in a way and we all know how the Federer matchup faired for him so I don't see Sock pulling off the win here. I'm not actually sure who the conditions favour more, maybe Sock, playing at home on a familiar hard court, coupled with the slowness as it will give him more time but I figure Roger will just out manoeuvre him. I'll go one close set but Fed in 2. The only real concern is Fed's patchy level so far and generally looking frustrated with some of his shots against both Seppi and Schwartzman. Let's see if he can raise the bar later today to book his spot in the Quarters. What do guys think? Will Roger sock it to him? Out of subject, the reason I was cheering for Kyrgios on Sunday is because I knew Dimitrov was gonna lose the next one. And I wasn’t wrong. The guy needs to regroup if he’s to achieve anything really notable! At least the AusOpen memories can be erased! I didn’t even mind the UFE’s ..well, with those balls & the night conditions, it seems they were unavoidable. I’m still smiling anyway. I saw that (non) smash Conal – terrible, and very unlike Nadal as he’s generally a good slam-dunker. We may complain about Feds’ error-strewn match, but frankly that Nadal/Young match was appalling throughout. If Young hadn’t continually choked, the match could very easily have been his as he’s certainly been playing a decent game of late. The fact that Nadal netted the smash despite having let the lob bounce makes it the BIGGEST smash fail ever. How does it compare to the one against Fiasco on blue clay? Pretty patchy by both, so long he get a W – I am pleased. He will be playing day match against Sock, lets do this Roger!!! What does it mean that the balls are “poor” or “ridiculous”? Not bouncing true? Too much bounce, too little? Isn’t there like a tour standard? Interesting kid Sock – is a Grand Slam winner in doubles with Pospisil – & in fact they’re still in the doubles draw here. Had some injuries last year, but seems to be back strong. I didn’t expect him to still be around at this stage though. Apparently a recent health scare with his brother has allowed him to play more freely as he’s figuring out what’s important. Roger should be able to take care of him, but if as Jonathan says Sock is more familiar with this venue, ie more familiar with tricky conditions and perhaps even the balls, it might be tight. 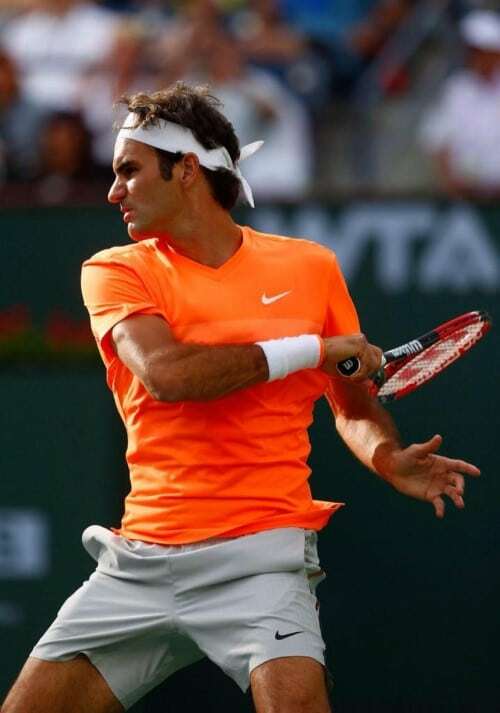 What I’m HOPING for though is to see Roger get more comfortable out there, & find some luminous tennis. Allez Roger! You’d expect there to be a standard, wouldn’t you? Wonder if there’s some correlation between the particular make of balls and this desert air we keep hearing about? (I thought the air was supposed to be thin and dry, which I’d have thought would have made the balls faster, if anything!) How is it decided which balls are used, anyway? Do the manufacturers have to pay the organisers for the (dubious if people like Nadal and Fed are slagging them off) privilege? Is it a question of highest bidder, or is quality/suitability taken into account? I see the IW weather forecast has completely changed again although it’s supposed to be a low of 2 overnight. Brrr – but I suppose they *are* in the desert. My take on the match: Roger ought to win this, but might take a while to figure Sock out since they haven’t played before. No idea how the balls may make a difference – could perhaps make it tighter than it ought to be – I was amazed to see the Djokovic-Ramos scoreline so tight. OTOH, should Nadal lose to Simon immediately before, all bets are off given Roger’s seeming habit of wobbling after unexpected Nadal losses! Nobody knows without playing with them or getting a full on explanation. Nadal said they are like stones and have no feeling, Gilles Simon says they are heavier but he likes them like that. Seems that the genuine gripe is how they react off strings and the surface. In terms of standards balls have to be on an approved list from the ITF – they go through certain testing for durability, size, mass, deformation, rebound all that kind of stuff and then tournaments are free to chose whatever balls they wish from the list. They have to bounce certain height when dropped from a set height, I think that’s the main test. @Alison the desert air does make the balls fly through it quicker, I think most players are complaining at how they are reacting off the strings and how they respond when they hit the surface. Once again Jonathan, spot on with the Robredo beating Dimitrov prediction after your Tomic vs Ferrer success. You are on a roll here ! Lets hope that Raonic beats Nadal :D. As for Sock, I think if he hits a purple patch he might be able to take a set off an out of sorts Roger but lets see ! I agree with you there. Young could have easily won that first set and ridden the momentum there. Nadal was lucky that Young was, well, Young. Simon obviously has a victory against Murray under his belt this year, not that it counts for as much as it used to, so he will be tough to beat. But then again, he needs to be consistent otherwise he might just collapse like he did against Berdych this year at Rotterdam ! Cheers Daya. I am the real Oracle 😆 just not on Larry Ellison’s salary. Coming off Dubai where winners flow from the racquet into Indian Wells is tricky. Point construction becomes way more important. Only saw the 2nd set for thank you for the shots from set 1. I have to say it was not a particularly inspiring match by either of them from what I saw, he did not seem happy, a bit like one of his little girls who also looked like she did not want to be there. Not sure what will happen with Mr Sock – I did enjoy his doubles play at Wimbledon, hopefully Fed will get back to his more comfortable winning ways and get the forehand working a little better – he is still the best thing to watch on TV perhaps with a close run 2nd by the new Poldark!!! Twins were in a bad mood in the stands, arms crossed! Allow me to elaborate. It isn’t revenge when you beat a guy who has taken just 5 sets off you in 11 meetings. It isn’t revenge when you beat someone who is nobody and who you’ve owned 11-1 in H2H. This game was just a case of Federer being Federer, and getting the job done, clearly indicating that what happened in Melbourne was a fluke. This win doesn’t mitigate the Melbourne loss. It doesn’t even assuage the pain I felt, we felt then, in a game where I declared Federer finished somewhere in the second set. That loss may have cost Federer a slam, considering that he wouldn’t have had to meet Nadal in the semi, and had a shot at Djokovic. I’ll tell you what revenge is, the type of revenge I’m waiting for. Revenge is beating Nadal on the dirt of Roland Garros. Revenge is when you hit back at him for the Wimbledon 2008, and Australian 2009 losses. Revenge is beating Djokovic at the US Open. Revenge would be claiming the WTF back from the Serb this year. Let’s not pick on the small guys and portray it as the greatest player of all time exacting revenge. It makes us look little. It makes me believe in what that Nadal fan said about us, that we don’t really understand tennis. Is the status of our champion so diminished that we are grasping on to victories like these? Have we reached that stage where we are beginning to, “aim small, miss small”? Everyone knows Melbourne was a fluke. Seppi was back to Seppi level and Fed was just in standard mode in IW. Never in doubt. But by beating Seppi last night the word revenge still applies. Whether it’s too strong of a word, or whether you or Federer want to call that it or not isn’t really the point. I don’t think enacting revenge implies it’s a big victory or a small one either – it says exactly what it is – losing at the hands of one opponent and then defeating them the next time you meet. The close proximity of the matches also makes it more interesting. Just like if Djoker beats Fed here in IW, it will be a form of revenge after Dubai. Would it compare to Djoker toppling Nadal at the French? Of course not. All I’m saying Jon is that this revenge theme against lesser opponents is really childish. It’s like those Nadal fans waiting for an opportunity to play Rosol, or Darcis, or Kyrgios, or Stan (Ok, against Stan it would be true revenge as he denied Nadal a slam). The argument is, we are making this win look like something way bigger than it actually is. It’s not. On the contrary, I’m actually quite scared with how Roger played last night, and am shuddering at the prospect of playing Nadal. If Nadal makes it to the SF, rest assured he will have convinced himself that he “cannot lose to Roger”, or he wouldn’t be there. Sid, I may not always agree with you, but this I agree with 100%! Fed wouldn’t remotely think of it as revenge either, I’m sure. Fed insists he’s not a revenge type of guy, I think he just means by that it’s not exactly a primary motivator for him. You can’t buy that completely though, surely 99.9% of people playing sport at any level want to beat someone they have lost to in a previous match regardless of how many times they have beaten them before. I know I do, you know you lost last time and the next time you want to win. Right again on Dimitrov Jonathan – you are most definitely on a roll with your predictions. Actually he really should have won this (but then, I say that every time! ), but two doubles faults when serving to stay in the match – virtually gave it away. Got the talent/shots but so often sloppy at the wrong time. According to commentators, still breaking in a new racquet. I hope Feds can cut down those errors – but they all seem to be suffering the same. What is it with the balls? You sort of expect it in Miami, but we’re used to seeing the balls flying here: nobody’s happy it seems. I’ve seen part-matches with Sock – the court does seem to suit his game, he has a decent serve, and he’s growing in confidence. Can’t disagree with your assessment. Yeah two for two on the surprise knock outs. Donald Young messed up my treble though. I think the balls still are flying through the air quick enough, but it’s how they react with the surface and off the strings of the racquet. But just speculating, you only get snippets from translated press conferences and statements that are never clear cut with specifics. Ohhhh so that’s why his level of play has been iffy! I didn’t realise the wack balls were a factor, was gonna be scathing in my review of his performance so far, but now I’ll cut him some slack 😉 At the end of the day, he ground out that win, regardless of how scrappy the affair was. It was weird though, seeing him get SO frustrated with himself. For a second (a teeny weeny sec) it was as though Murray was hustling out there. Sidenote – why is Dimitrov regressing? I guess we don’t know what it is for certain – conditions, balls or just playing poorly is contagious. No real high level matches yet from what I have heard, not really seen many myself though, just patches of highlights and Feds. Wretched match, low on crowd energy nd high on errors! Penn balls need binning, clearly hv no feel at all, like hitting hard pellets!! Loved the net exchange at the end, both of them moaning about conditions and balls!! Larry are you listening! I think Sock will try and hit him off the court but he does make a lot of errors. 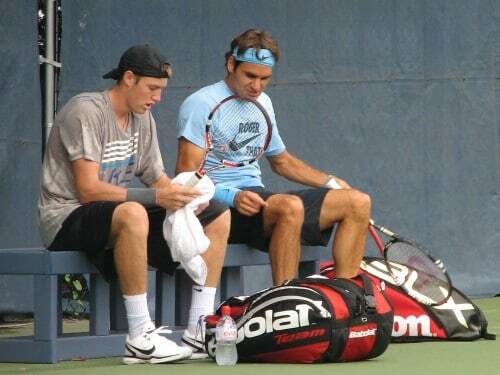 Also facing the Fed serve compared to the Bat Agut serve will cause Sock far more issues! Looking forward to a match where winners are higher than errors!! Picking Simon to beat Nadal! Bad batch? Used them in IW for ages never heard complaints before? Fed to beat Sock in 2 sets! For my money, Berdych looking the most comfortable but …. Agree Susie, Berdych does look the most comfortable: the court allows him more time to set up his shots, and he’s a heavy hitter so perhaps the ball doesn’t bother him so much. There’s no question that there have been more errors than winners for most players. Only exception, Robredo – he has a pattern of play and if he’s allowed to stay in that rhythm, almost every shot is safe, then all he has to do is wait for his opponent – Dimitrov – to make the mistakes! Couldn’t sleep last night so tuned in via SkyGo using my iPad. Watched with volume muted so as not to wake my wife and don’t have the benefit of having heard an expert commentator’s viewpoint! Scrappy match, Fed was better than Seppi without getting anywhere near his best. The last time I watched him was the sublime performance vs Djoko in Dubai. This showing was a pale imitation. He looked tired, frustrated. Far too many UEs for my liking. He really needs to up his game for Berdych, Nadal and beyond. Should be ok vs Sock though. Help me out, fellow readers, urgent. What should I do?